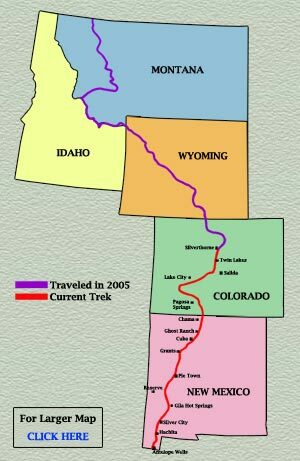 On August 14th the Nimblewill Nomad headed south from Silverthorne, Colorado, to continue his trek o’er the Continental Divide National Scenic Trail. For the next 65 days he hiked the Backbone of the North American Continent as he trekked on down to Mexico. Along the way, Nomad was following a general route mapped out by Jonathan Ley. Journal entries of the Nomad's day-by-day journey have been posted to the Journal section and are complete. Using the latest, lightweight, digital camera technology (see "Gear List"), Nomad was able to get some spectacular pictures. Please take a moment to check "Photos." This was certainly a great adventure. 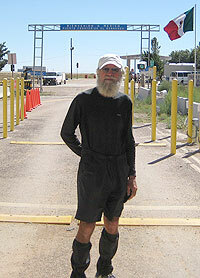 On Wednesday, October 17, 2007, at the Mexican border, Antelope Well, New Mexico (and less than two weeks before his 69th birthday), the old Nimblewill Nomad completed his southbound Continental Divide National Scenic Trail journey. By far, Odyssey ‘07 proved the most difficult of all previous treks. The loaded pack to haul provisions for great distances. The long, lonely days (and days) between resupply. The grueling climbs, countless of them in excess of 2,000 feet, above 10,000 feet, most-always proceeded by precipitous descents through rocks, boulders, and scree, no marked trail or treadway to guide the weary intrepid. And the weather, every conceivable form of weather: relentless wind, driving rain, pelting hail, sleet, snow, bone-chilling cold, scorching heat--and blue-perfect days--everything imaginable. But the reward, ahh the reward--remote wilderness, vast, untouched stretches of Nature’s best, 360 to the hazy blue, where presented breathtaking vistas beyond belief, bringing humbling appreciation afforded only one who toiled and struggled for hours to gain such heaven-bound pinnacles. Standing atop the world, in such special places, are created there such priceless moments, moments even the best photographer could not capture--spellbinding raw expanse, awe-inspiring mountain sentinels, legions reaching far beyond the horizon, and endless miles of unfettered beauty. 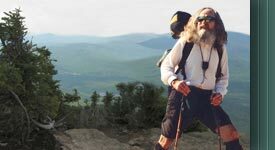 This video interview, of the Nimblewill Nomad, was taken by Andrew Skurka at a chance meeting in the Gila Wilderness of New Mexico, while hiking the CDT during the Nomad's Odyssey 2007.